It has been made aware to me that today printrbot is also releasing a Printrbot Plus V2.1. I just got word from Brook at printrbot that they will be selling kits again. This means you will be able to assemble your own bot once again. I was also told that the plus will be getting some upgrades at no additional charge. The Plus V2.1 will now include : LCD panel, heated bed, wider platform, acme rods, all aluminum bearing blocks on every axis, GT2 belts and aluminum pulleys. Printrbot is definitely doing it right and you get all of this and more for the same price as the V2’s. A lot of exciting things are going to happen at Printrbot which means we will have the ability to get the best that the consumer market has to offer. RepRap Squad will have to wait quite a while before we can afford this version but, hey we can dream can’t we? It’s almost like Brook and the designers crawled into my head and built the perfect bot. I can’t wait to see the products that come out of this printing platform. It is truly a thing of beauty with a few small design changes that may only be noticable to the true Plus lover. If you were debating on buying a Plus, now is the time to pull the trigger on this updated masterpiece. RepRap Squad has recently found out that Printrbot plans on releasing a Printrbot Plus version 2.2 and version 2.3. V2.2 will signify the dual extruder setup with a twist. Its a kit that will make your Printrbot Plus wider than before to accommodate the extra room taken up by the dual direct drive extruders. This is very exciting news and quite frankly a mod that we have been wishing for since we first got our Plus V2. It’s simple enouph to add some height to your Z-axis but, X-axis is a little more difficult. We haven’t seen any pictures yet to let us know how they plan on extending the width of this glorious bot. We assume that it woukd be some kind of bolt on that attaches itself to the existing base. However it could also be a new base entirely that would be ready and waiting for that aluminum bearing block we’ve been eying for the last few weeks that is now included as part of the assembled Printrbot line-up. I want to introduce you to the coolest thing since sliced bread and chocolate milk, the Printrbot Plus V2.3. This setup will be much like the V2.2 with the exception being that it will be designed for the triple extruder setup that we assume Printrbot will be releasing after their dual extruder beta is finished. Since the beginning, we at RepRap Squad have dreamed of a day that we could print on a triple extruder setup. Now knowing that Printrbot will offer a wider base along with the triple extruder, brings tears of joy as we anticipate its release. Printrbot has thrown us a few curveballs with the recent announcement of no more kits available but, they have definitely re-inspired the maker inside me with all these new mods coming out. 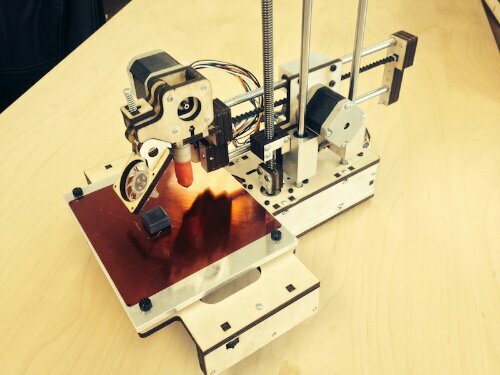 These add-ons are making Printrbot to be a force to be reckoned with. You may not be able to buy non-assembled printers anymore with exception of the Printrbot Simple but, you can still however personalize your bot to fit your needs even more than ever thought possible. We’ve always been a fan of making our printers represent who we are and what we like and I must say that I’m a wide, tall, triple extrusion kinda guy. We will definitely be updating as we get anymore information on this great list of soon to be add-ons. This is the new news from Printrbot. Many changes are happening and Printrbot has a new focus. The Jr. is all grown up. Upgraded in every possible way. The new revision features are:6x6x6″ build volume (216 cu. in. )Heated Aluminum Bed (super flat! )Machined Aluminum Z axis blockAll 12 bearing blocks are machined from aluminum.3/8″ ACME rod for silky smooth Z axis movementIncludes ATX power supply + Power Tower (ABS, PLA, etc) AND smaller laptop style power supply + spool coaster for printing PLA on the go.Same great folding design, but sturdier when set up to print Streamlined width, longer base, but same overall length – still fits in a back pack when folded1.75mm Direct Drive with fan to cool your PLA prints. Printrboard access is now underneath for convenience and a sturdier baseBelt tensioners built in for X and Y axisOur new Printrbot Jr. v2 will replace the Printrbot LC as our medium sized and medium priced 3d printer. It offers better equipment and the added convenience of folding up to save space and ease travel. It’s the best of both desktop printing and portability at a competitive price. We think you will love it. This is the first time we have introduced a bot that is only available fully assembled and calibrated. We have had a great run with our kits, but as the market matures and more and more newcomers delve into the wild world of 3D printing, we want to be able to ensure great success the first time around. If you were hoping to put together your own Jr, we will have the v1 Jr on sale all week, so get them while they are still available. New Focus on Fully Assembled Product Line! Buying an assembled Printrbot ensures the best possible experience. Take it out of the box, install the software, and start printing! As our company grows, we want to do our best to ease headaches and avoid any problems for our customers. We had a great run with our full product line being available as assembled bots AND kits, but its time to focus to keep up with demand. 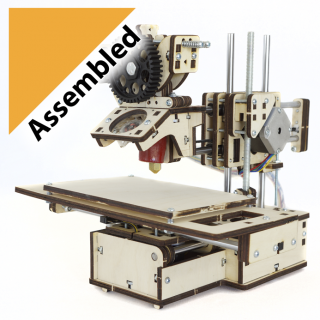 The Printrbot Simple (4x4x4″ build volume) is available BOTH as a kit ($299) and a fully assembled bot ($399), so if you are a Maker and want to build – go for it! The Simple is also, well, simpler to build. 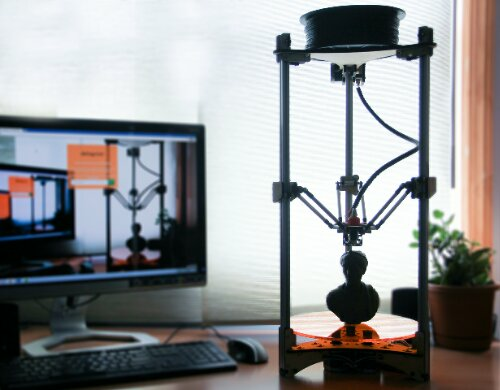 It is the perfect bot to learn 3D printing – we encourage everyone to build their Printrbot Simple, but at a mere $100 premium to avoid any unforeseen snafus – the fully assembled version is tempting, indeed. Having the Simple as such a great introductory printer at a mind-boggling price gave us the confidence to focus on the Simple as our sole kit offering. 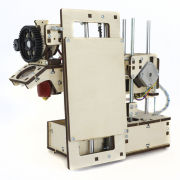 The Printrbot Jr.v2 (6x6x6″ build volume) is assembled at $699 and offers a sturdy, compact, travel-ready option. The Jr. v2 is still quite small but with a respectable build volume – check out the overall box size of the competition out there! We are confident that the Jr. now holds it’s own when compared to any printer with equal build volume, bar none. The added rigidity of this bot quiets all concern that only printers inside a box can produce great results. It stands alone as the printer that fits in a backpack (OK, so does the Simple). If you want a desktop 3D printer, but can see yourself lugging it around to meetings, vacations and the local hackerspace -this is a great choice.The Printrbot Plus (8x8x8″ build volume) is our flagship printer with a massive 512 cu. in. 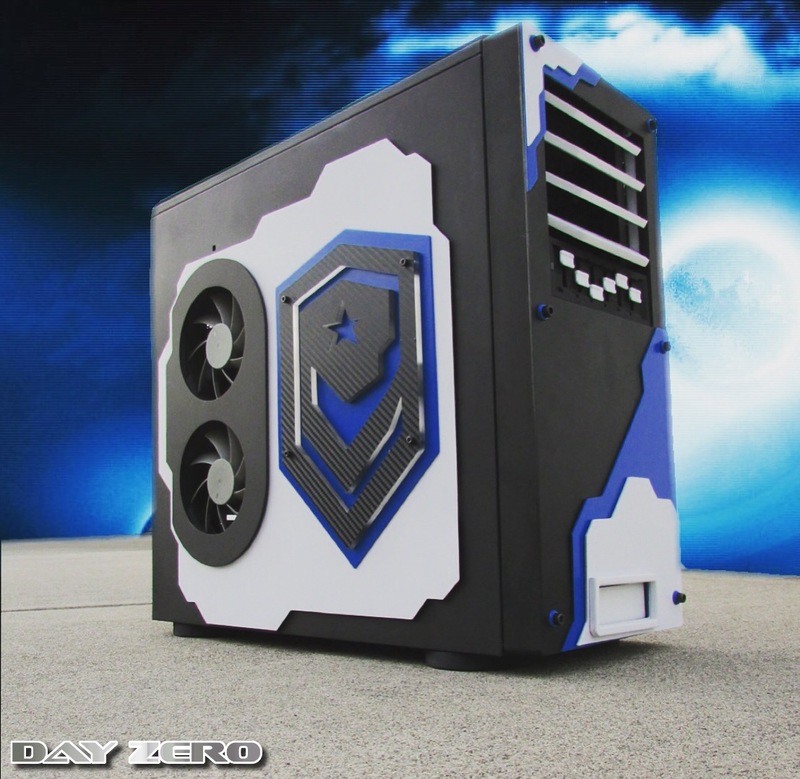 build volume – even more volume than a Replicator 2 (410 cu. in). Compare the price of a Plus at $999 to a Replicator 2 at $2199… that’s less than half the cost with more build volume! If price and build volume matter, we rest our case. Our new ultra-flat heated aluminum build plate is a huge improvement! A flat platform means less problems and better prints. We are testing our dual and triple extruder upgrades for the Plus and will soon equal and even surpass Makerbot in the multi-head extruder game. And did we mention the Plus is half the cost? The dual-head Replicator 2X is $2799. OK, enough comparisons 🙂 We love our Plus and are excited to focus on making it even better as a fully assembled bot. Our Printrbot Simple debuted with our new 1.75mm direct drive extruder, and it is a big hit! It is smaller, has a custom machined drive gear, and comes with a fan to ease PLA printing and small objects. This combination has proved to be a winner. 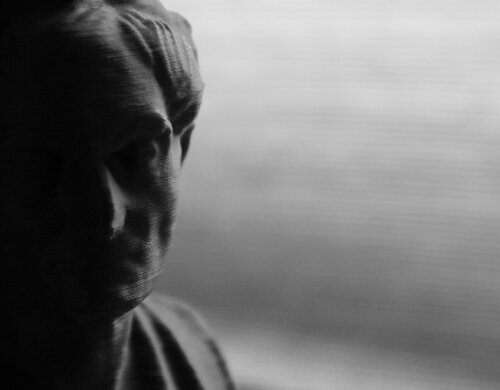 While technically, you can’t really say it prints better than a 3mm setup, it does offer some clear advantages. 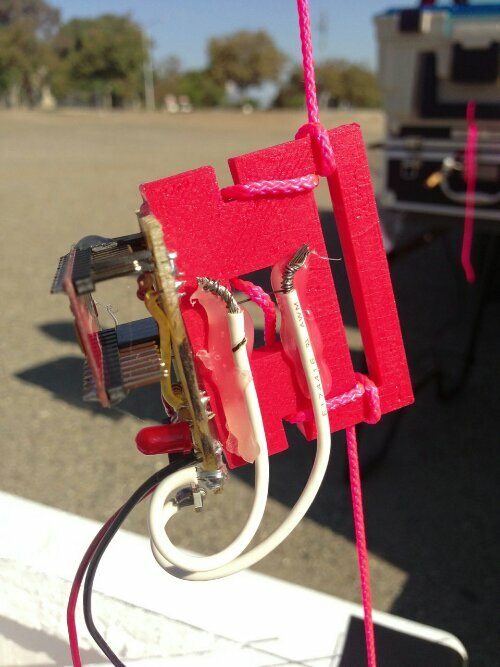 Our designs are as small as we can make them, so its a great fit for Printrbot. Imagine two (or three) side by side in a multi-extruder setup. Our cantilevered design for the Simple and Jr benefit from the lighter weight. All our printers can potentially move faster with less mass to drag around, too. We have added some additional colors to our 1.75mm PLA filament line and new 1.75mm ABS colors are on the way. To reduce confusion when buying, and to streamline our options and SKUs, we are moving to ALL 1.75mm ALL the time. If this move has you upset with a deep library of 3mm filament, not to worry… we put our 1.75mm direct drive conversion kit on sale to ease teh pain. All our legacy models can be fitted with the new 1.75mm direct drive extruder setup – be sure to grab a 1.75mm hotend too! Check out our close-out sale on 3mm filament too. On a personal note: I have gotten LOADS of kickstarters begging me to throw my support behind their project… I almost never do. But one of my meetup attendees pulled out the sweetest ratchet wrench I have ever seen or used. I begged him to sell it to me right there. I am not kidding – there is no way I can explain how good this wrench is… it is so silky smooth with absolutely ZERO backlash or lost distance when engaging the drive. I am sitting here grinning just thinking about it. 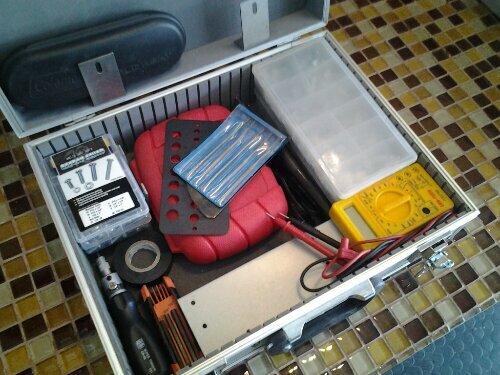 I love tools and have grown to appreciate the RIGHT tool for the job… you need this tool. When he told me he wanted to do a kickstarter, I immediately gave him all my tips and volunteered to be in the video. I am not getting paid to endorse this at all, but he was kind enough to ask me to be on his board! Why? (wait for it…) The handles are going to be 3d printed! I love this. Love it love it love it. If his kickstarter funds, I will volunteer to offer the printing power of our community – a venerable 3D print army! Each printed handle will earn a fee and we can all be part of a new way to manufacture. Its been a pet pieve of mine for a while that people throw around “decentralized manufacturing” and other claims about 3D printers and printing. I have never actually seen this at work. Now is our chance. I hope you will consider backing – you WILL NOT REGRET IT…. this wrench is so choice… AND you can opt to be a part of the Printrbot 3D Print Army that will fill these orders. I, for one, hope this thing happens just to have a real example of ACTUAL decentralized manufacturing from community members. (End of excited rant). We are committed to making better products… to innovating… to making 3D printing easier for the masses… to challenge the margin-heavy prices of our competition… and to supporting our community and customers. To our ever-patient customers, may I introduce our FULL TIME customer satisfaction guy – Dave Hayes. Dave is my brother-in-law who wisely married Sarah, my wife’s baby sister. For over a year now, I have secretly been interviewing him – he didn’t even realize it until I offered him a job. In short, Dave will shore up my impulsive, shoot-ready-aim approach and treat our beloved customers as they should have been treated from the beginning — with top tier documentation, fast trouble-ticket turn-arounds, an actual phone number to call and talk about your needs, and a good-guy demeanor that stands out so strong, I have never seen it’s equal. I know that is high praise, but seriously, you will love this guy. Be gentle. He starts Monday and there is a significant backlog… but we are all rallying around him to get him off to a good start. We are glad he is here. Welcome, Dave! Thanks to all our customers and supporters. We love you all. DeltaPrintr – About To Hit Kickstarter? Many of us have seen delta printers and their many variations. The DeltaPrintr however is engineered for simplicity and easy operation with great results, a 100 micron to be exact. It also uses high strength Specra line to create linear motion instead of belts which is a cost savings passed on to the customer reports DeltaPrintr designers. It’s main attributes include ease of assembly and less time being spent calibrating. This design had some main goals from what we can tell, one of those being more time printing and less time trying to get it to print. Another thing the DeltaPrintr designers spent time on was interchangeable parts that are easy to hack and mod for you true makers out there. 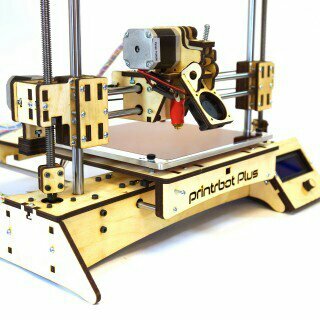 The price for one of these printers has not yet been comfirmed but, we at RepRap Squad expect it to be very competitive compared to other printers on the market today. Below you can see a sneak peek of the print quality leaving us wanting more. No belts can only mean one thing, less slips and more quality prints. It seems to me that the DeltaPrinter should have a good sized print volume yet no specific size has been comfirmed. With a top mounted spool convenience and portability look to be a plus. Check out more info on the DeltaPrintr HERE as it’s expected that this printer will be a hit for both beginners and pro’s alike. Shai from DeltaPrintr says, “We are considering offering kits on our kickstarter for those who already have most of the components to build a Deltaprintr such as motors and electronics. 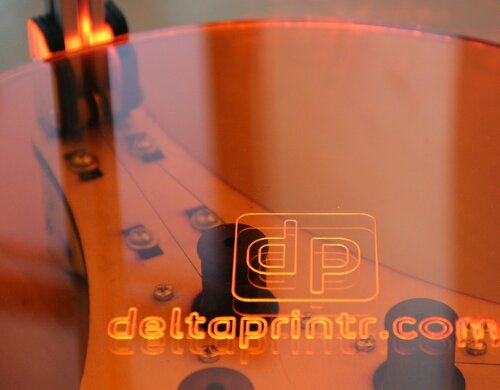 Although, we will be manufacturing our own electronics in a professional encasing so that any 3D Printer enthusiast can use our board without having to fiddle with wires (simple plug and play).” It seems to us that DeltaPrintr is looking at the big picture when it comes to what many enthusiasts want. Shai goes on to say, ” Speaking of plug and play, we designed a beautiful manual for those who are complete newbies to 3D Printing. Unlike most companies who offer kits for their users and then simply point them to a youtube video or a half-finished text manual put together by community members, our intentions are not just to showcase how to assemble a Deltaprintr through very easy to read visuals, but also to give tips to users along the way as to how things work so they learn something throughout the process of assembling their Deltaprintr.” With this we can tell that a good part of their focus is on teaching beginners how to build, print and let out their inner maker. It’s a smart direction to take as 3D printing is becoming more mainstream everyday. One thing that detours new builders is a lack of direction as they want to feel like no matter what issues they run up against, they can find the information needed to solve that problem. We believe that one focus that DeltaPrintr should have is an active forum. This has proved to be an invaluable tool for Printrbot. I must also say do to some people’s confusion that DeltaPrintr is doing a contest for links. I posted my link above as many people have done. Even though it would be cool to win a printer to donate use of but, I’m not writing this to win anything as my main focus is to bring my readers good content on the 3D printing industry. If you would like to visit DeltaPrintr without using that link, feel free to click HERE to be forwarded to DeltaPrintr’s site. Check back here @ RepRap Squad’s page for the latest Printrbot news as well as info on the jr. Before it comes out. I’m commonly looking through my large backstock looking for specific nuts, bolts or tools. 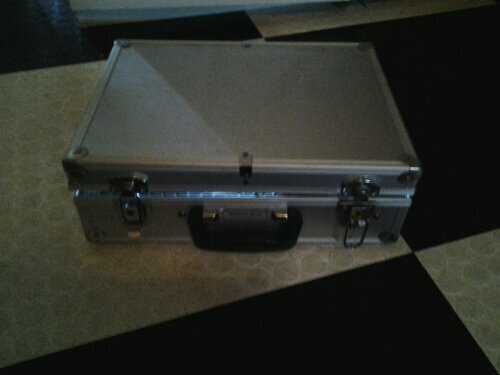 So I decided that since I already had a nice case that I wasn’t using, I should put the most commonly used things in it. 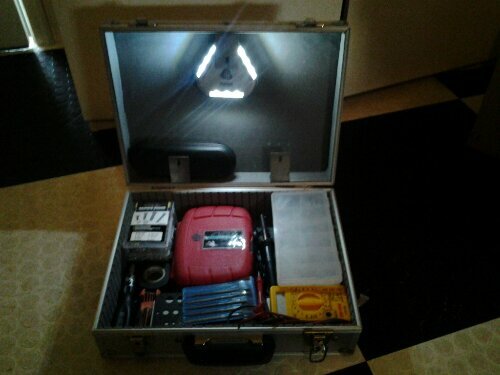 Some ideas I had of things to put in this case include: Scrapers, multi-meter, electrical tape, allen wrench set, soldering iron, complete ratchet set with lots of attachments, small file set, nuts, bolt, washers, and a few other printer related items. Now I just needed to figure out a way to not only fit everything in the case but, do it in a way that everything is organized and easily accessible. I had a few small plastic organizers in different sizes. So I went about laying them out. I found that if I stacked them on top of each other then I should have enouph room to fit the rest. I used some extended L brackets to make a little kind of shelf by using the brackets to bolts the top container down whioe leaving room for the other one to slide underneath. For the other 2 smaller containers I used different brackets to mount them against the sides using pressure to hold them in place. After that I mounted an piece of metal scavenged out of an old printer to make another shelf in the front to put my multi-meter and files on. This mounted easily by adding a couple nuts and bolts. 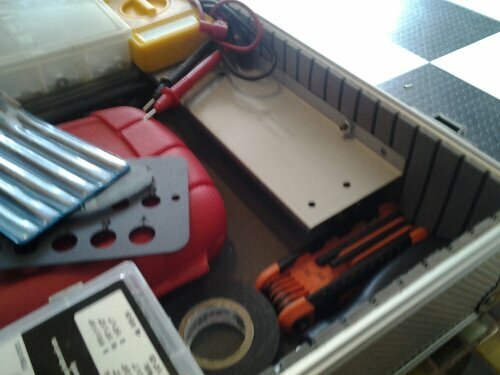 All I had left was to add 3 more L brackets to the lid to mount my adjustable LED light and cold soldering iron. Everything went together very efficiently and I actually still have room to put more things. This case is great to have as a quick go to when working on my printer or when I take it into the field for teaching classes. Things that I plan on adding for sure is my micrometer and maybe my level. If you want to build one too you can find these cases online or at your local store. They come in all shapes and sizes. 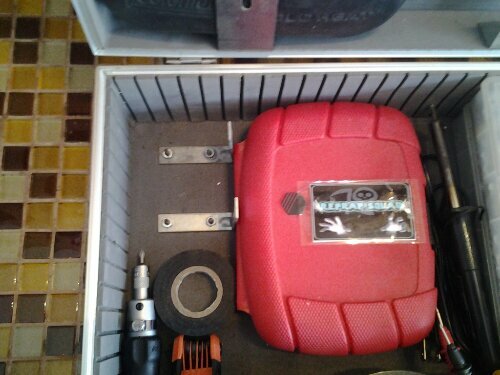 Another idea is to buy foam and use your tools as a stencil to cut out little recesses for your things to sit in. Printrbot Jr. Getting A Makeover? Make sure to check back often for the newest news! Update: I just got news that the new Jr. Will have a 6×6 bed and also come with a heated bed option. I also found out that the z axis will be upgraded to ACME precision rods. I posted a link to and early picture of the jr. V2 and Brook at printrbot said he had an epiphany today on the design. Impressive Printrbot, impressive! 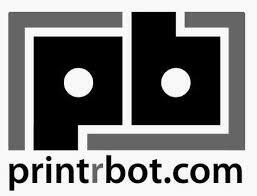 Update: August 17th 2013 6:54pm – The new Printrbot jr. V2 has officially been released for purchase. This news comes with information that Printrbot is re-structuring their line-up and focus to more plug and play appliance like printer. 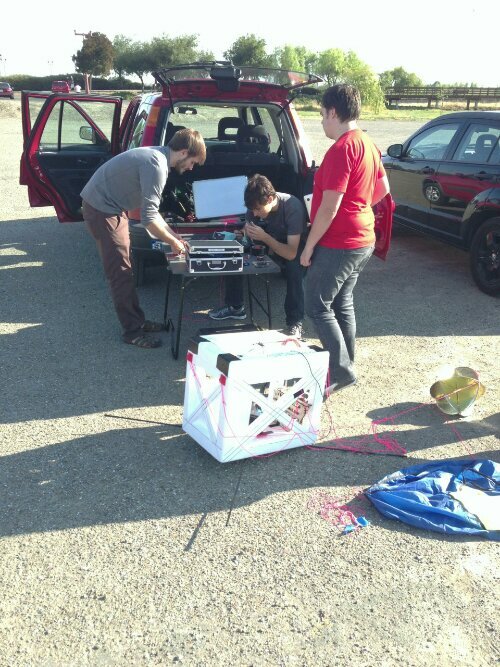 Update: August 4th 5:30pm – New news on the Printrbot Jr. It will have aluminum blocks on all bearings and the printrboard will mount from the bottem. It’s being said that it will have ultra regid construction. We will update as we fimd out anymore information, so check back or sign up for email notification! 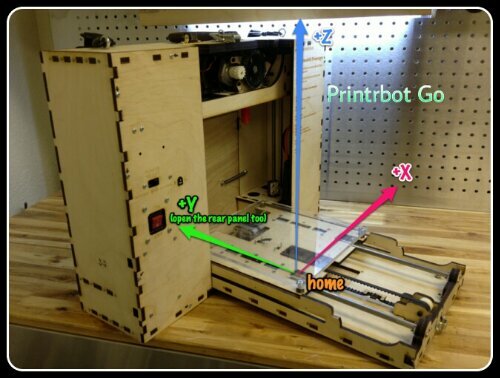 RepRap Squad has speculated for some time that the Printrbot Jr. will be receiving a makeover. Until now it has just been speculation. 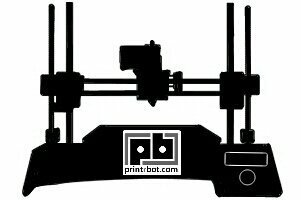 We now have conformation that Printrbot will soon be releasing the Jr. V2. A lot of different upgrades will be had for sure leaving the Jr. better than ever. We think that ACME Z-axis rods may be one of those upgrades and no matter what we know that this long standing platform will quickly become a favorite of newcomers and enthusiasts alike. The Jr. V1 will be retiring anyday now to make way for the new and improved V2. You can expect all of the great innovations built into the original Jr. with a combination of all the new techniques and design Printrbot has mastered over the past couple of years. We would assume that a price increase would follow as the new V2 will most definitely have a lot of upgraded parts. The Jr. 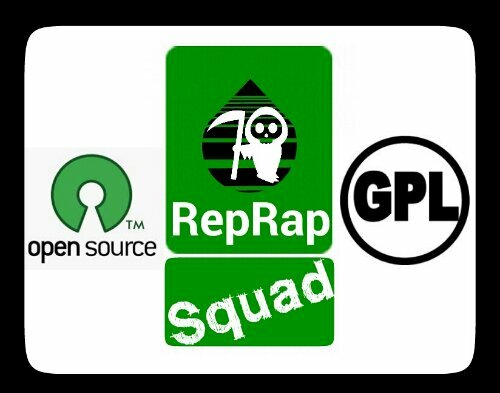 Platform is one that RepRap Squad has never built but, definitely seen in action with promising results. 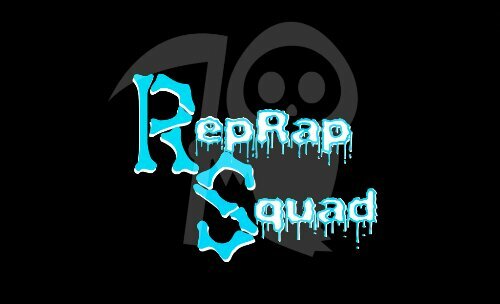 Plans for RepRap Squad are in the works to eventually adapt V2 Jr. Files to be cut via CNC as Brook-the creator of Printrbot has a good habit of releasing his files into the wild for such experimentation. No word yet if Printrbot will release a builders kit as they did with the Simple but hey, we can all wish cant we? 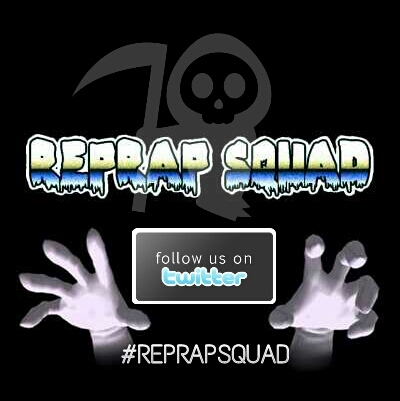 RepRap Squad will be closely following the Jr’s growth from V1 to the new and improved V2. So check back for all the latest updates and the best Printrbot news! @ei8htohms yes, we are planning a weekly video podcast/hangout to cover some if these issues for newbies. We are probably two weeks out. I have noticed that Printrbot is spending a lot of time lately on getting everything streamlined for new customers and people that may not be savvy in the 3D printer feild. 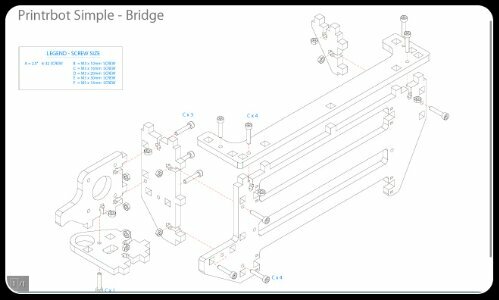 Recently they have released a new, “Getting started guide.” They have also put a lot of effort into releasing new exploded view diagrams for there bots. 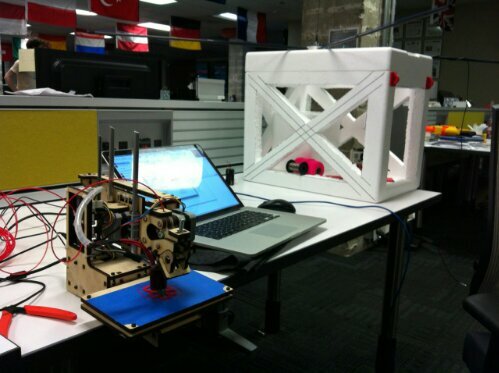 This new news posted on Twitter shows the dedication that they have reserved for helping people find their way into 3D printing as well as helping customers asymboly, build and modify their bots with ease. Future plans that I forsee for Printrbot are looking good and I imagine that they will take their already impressive customer service to the next level.